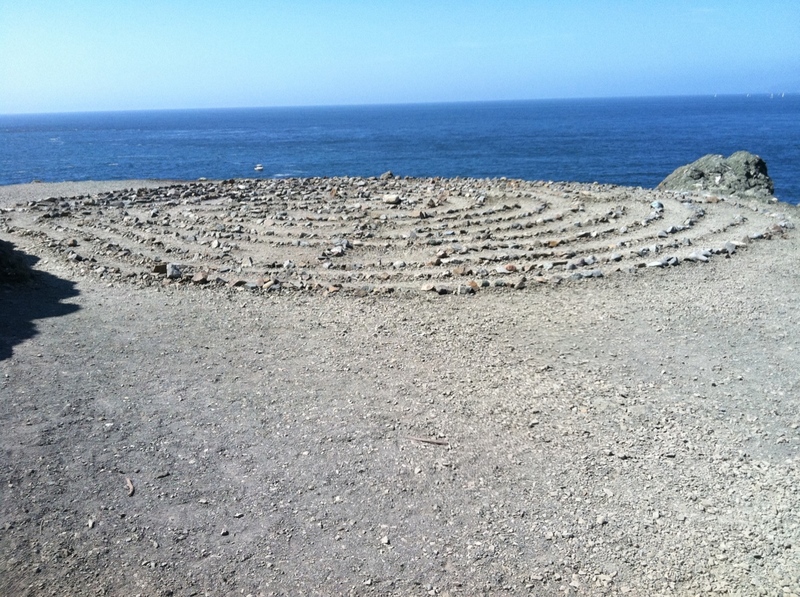 In an earlier post (Tommy on the edge of a cliff), I wrote about the experience of walking the labyrinth at Eagle’s Point in San Francisco’s Golden Gate National Recreation Area. What I didn’t write about was the role technology played in finding the location of the labyrinth, which is a user-created feature of the GGNRA and not officially acknowledged. As I wrote in “Tommy on the edge of a cliff,” a Google search located three labyrinths in San Francisco and I decided to visit the one at Eagle’s Point along the Land’s End trail where the bay meets the ocean. Before I left to drive across town, I plotted and saved the journey on Google maps on my trusty iPhone. Once I arrived at the trailhead, I relied upon the GPS function of the iPhone to find my way to Eagle’s Point. I was surprised to find the trails in the GGNRA clearly marked on Google maps but quickly found that the GPS that works so seamlessly on city streets and freeways was out of its depth. The twists and turns of the trails made simple instructions—”take the next left”— seem meaningless and vague. What on later occasions would be a 20 minute walk turned into a circuitous 40 minute hike. The conclusion I draw from this experience is not the inadequacy of GPS in non-urban settings but how completely the use of GPS has infiltrated my approach to finding my way. I later found that the trail markers in the Land’s End area of the GGNRA clearly indicate the directions to Eagle’s Point and following them creates a much shorter route to the labyrinth. As a note: this post was inspired by the Omni Project of Portugal Consulting, “a self-funded study about the impact that digital technology is having on our lives.” Well worth checking out.